“It was indeed a blessed moment to have a conference of that magnitude. I was blessed in particular, to understand prosperity gospel and public theology among other pressing societal needs.” Rev. Jonah Lagat, General Secretary of the (RCEA) Reformed Church of East Africa in Kenya. If you sit around a table with representatives of all our Reformed sister churches in Africa and reflect about being church in Africa, you can not help to be amazed: at the head of the table sit two newly-found friends – the general secretary of the Lesotho Evangelical Church in Southern Africa, Rev. Nelson Posholi and Dr. William Zulu, the general secretary of the Reformed Church in Zambia – respectively descendants of Moshoeshoe and Shaka, who were still archenemies in the 19th century during the infamous Difaqane (time or troubles); now developing a close friendship. Right across me sits the general secretary of Angola’s Igreja Evangélica Reformada de Angola, Alberto Daniels – someone who was as recently as thirty years ago still from a hostile country. So what has happened in the meantime? The Reformed Family Forum (RFF) was established in 2015 as a result of the need for liaison between our sister churches in Africa and to celebrate and strengthen our shared family history, confession tradition and identity on our continent. This forum should not only serve as a network but, above all, provide a platform where this church family can brainstorm and reflect on what the current role and challenges of the church of Christ in Africa are. This year we met at the beautiful Lumko Institute’s Retreat and Conference Center in Benoni from 3 to 5 August. The RFF (http://rff.christians.co.za/) currently consists of the general secretaries of a family of Reformed churches in South Africa, Lesotho, Botswana, Swaziland, Zimbabwe, Zambia, Mozambique, Malawi, Kenya, Angola and Nigeria. 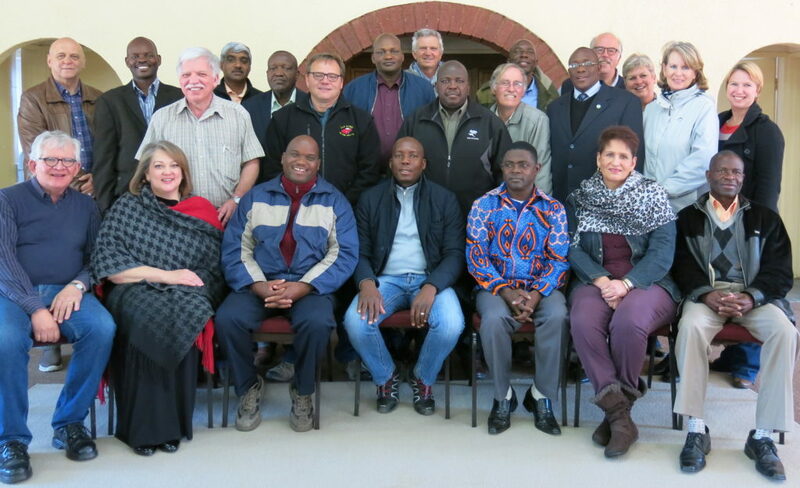 Partnership representatives of Witness Ministry (URCSA Cape Region Synod and DRC Western Cape Synod), Partners in Witness (DRC Free State Synod), NetACT (http://netact.christians.co.za/) and CLF (Christian Literature Fund: https://www.clf.co.za/) are also part of this forum. During the first session the members were introduced to each other and briefly shared what work, projects and challenges they have to deal with in their respective ministries. Countries such as Angola and Mozambique still struggle to eradicate post-war consequences of the destruction of infrastructure, poor schooling, and so forth. Most of them struggle with corruption and poverty, like us here in South Africa, while others are struggling with the impoverishment of the gospel as prosperity theology. This year there were a lot of firsts: It was the very first time that URCSA appointed a general secretary, and what is more, she is a woman! Me. Desiree Brown, formerly employed in banking, was welcomed with great enthusiasm. Her expertise and valuable contributions were received with great appreciation during the meeting. “It made me realize that the Gospel of Christ still has the penetrating power to speak to our people as it did 2 000 years ago,” her Facebook entry reads afterwards. It was also the first time our sister church in Angola could attend the meeting, as well as their general secretary, Alberto Daniels – it was also his first visit to South Africa. He was deeply touched to see that there was already a chapter of their church published in the book, A Family of Reformed Churches in Africa. The fact that there are other Reformed sister churches in neighbouring countries is comforting and encouraging, especially for the churches who are suffering in their own countries. It was also the first time that the Lesotho Evangelical Church in Southern Africa was invited to be a new member in the circle. Rev. Nelson Posholi was immediately requested to assist Dr. William Zulu and me. Desireé Brown to set up a guideline document for the general secretaries’ job description. This diligent team took up their task very seriously and helped (with the input of the rest of the group) to compile a meaningful document that will be of great help to general secretaries in future. The value of the Christian Literature Fund Partnership was explained by their marketer Berlise Louwrens and editor Danny Fourie during the launch of a wealth of pamphlets, books and sermon guides; all valuable tools that discuss relevant themes in various languages ​​in an attractive way. Their manager, Charmaine Stofberg, was also present. It was also of great importance that Rev. Nico Mostert from Bloemfontein, who represented NetACT, was present. NetACT is a partner that forms a network of theological schools, of which all these RFF churches are members. They do not only contribute to the promotion of pastoral education, but NetACT also offers these members the opportunity to help develop a church theology from and for Africa. Books like “Men in the pulpit. Women in the Pew?” and the award-winning “Living with Dignity” has been developed and published by NetACT. The rest of the weekend was devoted to reflect on topics such as how to be a missional church, how to understand public theology and public witness, what role the church should play in this and how to understand and handle prosperity theology – concepts that were for most of our group still vague and unclear, but which were well discussed with the input of experts and researchers and tested and highlighted by the Word of the Lord. The kaleidoscope of the quality of input from the diverse backgrounds of these members has just made us realize how rich our Reformed Church is with its more than 8 million members in Africa and how important it is to discuss our challenges from our different contexts with each other. May the RFF always helps to guide in such a way, that the world can see we belong to Christ.